Due to a job-inspired relocation a few months ago, we’ve been spending many weekends and holidays at my in-law’s so that we can be with family, visit friends, and generally keep in touch with the area that we have considered home since birth. My in-laws have a beautiful home that had one problem: no internet access. Given that I, and my wife, and even our 12-year-old (ToonTown, YouTube, and the Wii), are essentially connection-dependent, I set out to find a low-cost, good-enough solution to our intermittent but uncompromising needs. In our new home, we are AT&T DSL subscribers, and have been very happy with the reliability and speed of the connection (especially compared to the a Comcast broadband we left behind at our old house; Comcast doesn’t serve our new hometown). We have a 2Wire DSL Gateway feeding an Apple Extreme providing wireless and a printer to an iMac, two MacBook Pros, an old PowerMac G4, the Wii, the PS3, and an iPhone. Works flawlessly. So, the first attempt was to get AT&T DSL at Grandma’s house. At the time, they were offering offer a low-bandwidth plan for $10 / month for the first year. Sign us up! We opted for the self-install route, so a box arrived in a week or so, we installed it, we learned the lesson about having to filter every phone in your house, we learned the lesson about not forgetting about filtering the alarm system, and we were plugged in. With one computer. Time for wifi. 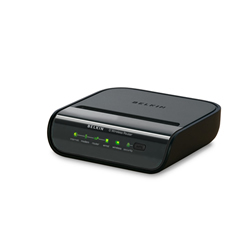 A trip to the local Best Buy, maybe my favorite store, and we were the proud owners of a low-cost, good-enough Belkin Wireless G Router for $40. SSID established, password configured, voila. It worked for about an hour. Suddenly, though the wireless connection was strong, the bandwidth slowed to a trickle. Hmm. Didn’t really see anything wrong, so restarted the router. It worked for a few more minutes. Ok…. Let’s try restarting the modem. That worked for a while, then didn’t. Restart, repeat, restart, repeat. That first weekend was a frustrating one. By Sunday morning, I decided to have AT&T come out, and they were able to visit that evening the check the line. We weren’t home, but they left a note on the door saying that we were too far from “the loop” for DSL to work in our area. The handwritten instructions were to return everything in the box. Sigh. Ok, so, the $10 / month deal was too good to be true. Should have know that. Fortunately, I never throw the boxes that come with electronics away, so we were good to go. Goodbye DSL filters, goodbye modem, goodbye trickle-y internet connection. A few days of research revealed that there really weren’t a lot of options left to us. Given that my in-laws were already Comcast cable subscribers, I gave in and ordered Comcast. Their lowest-cost plan is $25 / month, a lot more expensive, but it seemed worth it if it would, well, if it would actually work. Another self-install model box later, a router factory-reset, a new SSID just so no one would be confused. Voila! We were back in business. For two hours or so. OMG. Router reset. Modem reset. Router reset. Still flakey. This is a nice way to spend a weekend. Alright, let’s plug in directly to the modem to see if it is the wireless. Hmmm. Works fine. Check for firmware updates. Nope, on the latest. Ok, check the review. Ah. Looks like I bought the wrong router; the reviews indicate similar problems, no easy resolutions, and general unhappiness. About a month had elapsed since I bought the Belkin, but I still had the box and the receipt and decided to go back to Best Buy and try again. Since I didn’t have a good connection, I didn’t have the time to do the research I normally do before making an electronics purchase, and since I still had the “low-cost” mentality, I was trying not to just buy an Apple Extreme or Express, I upgraded to a Linksys Wireless-N Router. Seeing “Cisco” on the box bred some confidence to the decision given my experience with Cisco in the enterprise. It was on sale for twice what I paid for the Belkin, but it was an upgrade from G to N and would hopefully actually work. Ok! Back home, plugged in, new SSID, new password, everyone connected (and a little crabby with the whole situation, myself included). Let’s get caught up on email, Facebook, ToonTown, check some movie times, etc. Two hours later, it was still working well, and the low-bandwidth connection from Comcast seemed speedy enough. Time to get out of the house and forget about it. Naturally, the wireless was dead when we got home that night. It is a sign of just how connection-addicted you are when you are somewhere without a reliable connection. I love my iPhone and the 3G in metro-Detroit was very strong, but you still need a good laptop connection to really get your fix (it is too bad that iPhones don’t support tethering in the US yet; it is the only thing I miss about my BlackBerry). I plugged back into the router to do some more research, and learned that even the Linksys has some not-particular-positive review. Wow, that is surprising to me. But: uncle, white flag, I give. It would only be another $20 to upgrade to the AirPort Express, which should provide all the wireless energy that we need. Router back in the box, drive back to Best Buy (thankfully, there is a Starbucks on the way), Linksys returned to the same customer service representative who took back the Belkin (“You’re back already?”), Airport in hand (for, surprisingly, $10 more than they charge at the Apple Store, but I’m tired of driving around), back home, plugged-in, and, of course, it works. All evening. And in the morning. No restarts, no reboots, no familial crabbiness. Flawless bliss. The ultimate solution is more expensive that what I was looking for: $25 * 12 = $300 / year for service, plus the $109 for the Express. If the original solution had worked, it would have been $120 / year and only $40 for the Belkin. At least I tried to save some cash. I failed, pretty fast, and in the process I reconfirmed that I am a fan of Best Buy and Apple. And I reconfirmed that the fail fast model works. The only lasting question is: How darn many times will I have to learn this lesson?